Are you unable to export your Camera roll photos and videos to your Windows PC or Laptop running on Windows 10, Windows 8 or Windows XP? 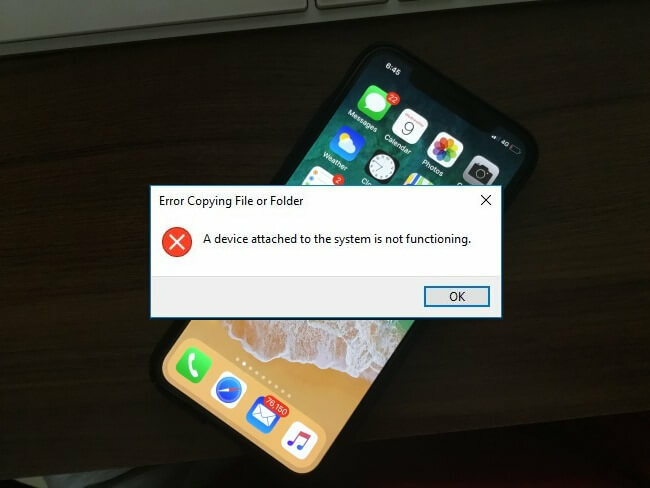 Because you are getting the error message like A Device attached to the System is not functioning after the update or during backup. Get Quick fix and transfer media to PC successfully. Unlock your iPhone first and Allow this computer or PC trusted. Your iPhone will show the popup message like Allow or Deny your iPhone Access on Windows PC or Laptop. Go to the Settings app on iPhone > Photos (Scroll down and find). iPhone X, iPhone 8, iPhone 8 Plus: Press and Hold side button + Volume up button until you see a slide to turn off on screen. Once you turn off, Press and hold side button only to wake up and restart. iPhone 7,7 Plus, iPhone 6,6 Plus, 6S and earlier: Press and Hold side button only until you see the slide to turn off on screen. Use side button after turned off. Also, Restart Windows: Go to Start menu > Restart. If you liked this post and helped you, Personally share this article to help others on fix the problem while transferring to PC A Device Attached to The System is Not Functioning message.